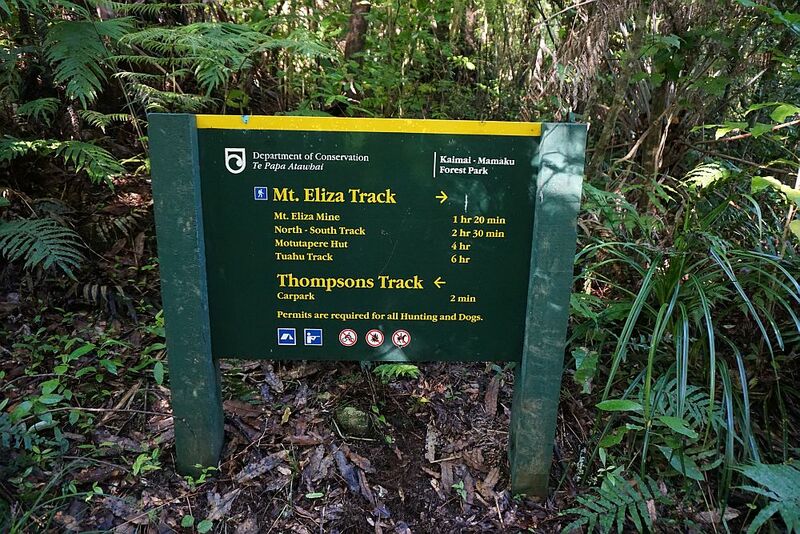 The Mt Eliza Mine Track connects the North South Track in the Kaimai Range to Thompsons Track, south-west of Katikati. 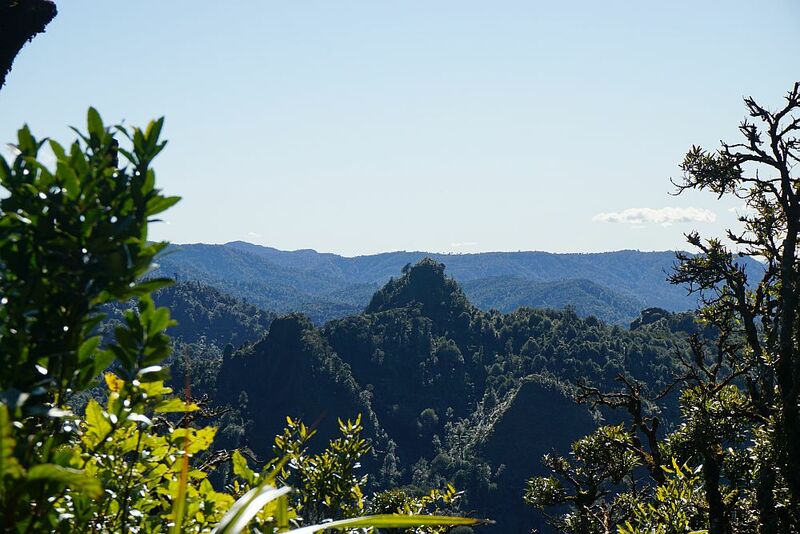 Thompsons Track consists of two major parts: a road from SH2 south of Katikati to the boundary of the Kaimai Mamaku Forest Park, an impassable 4WD track crossing over the Kaimai Range to Thompsons Road, off Te Aroha – Gordon Rd on the western side of the Kaimai Range. 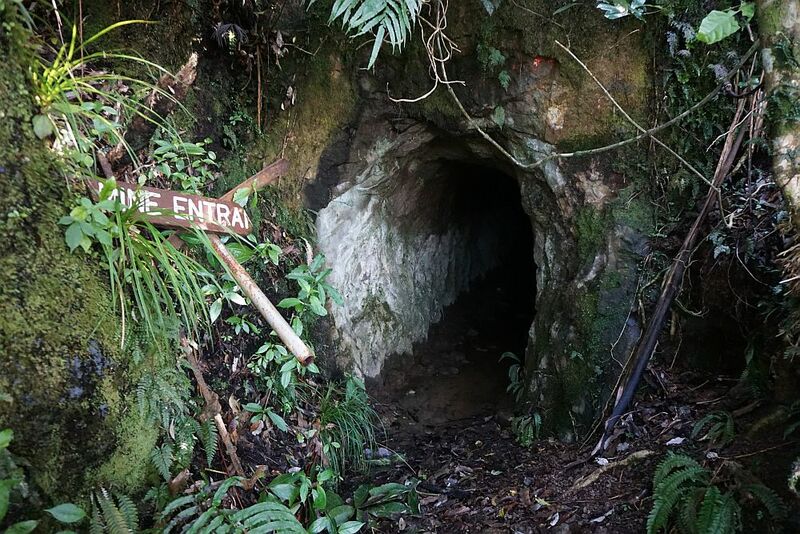 The Mt Eliza Mine Track passes the old, abandoned Mt Eliza gold mine, with part of the track consisting of the pack track used to transport supplies to the mine. 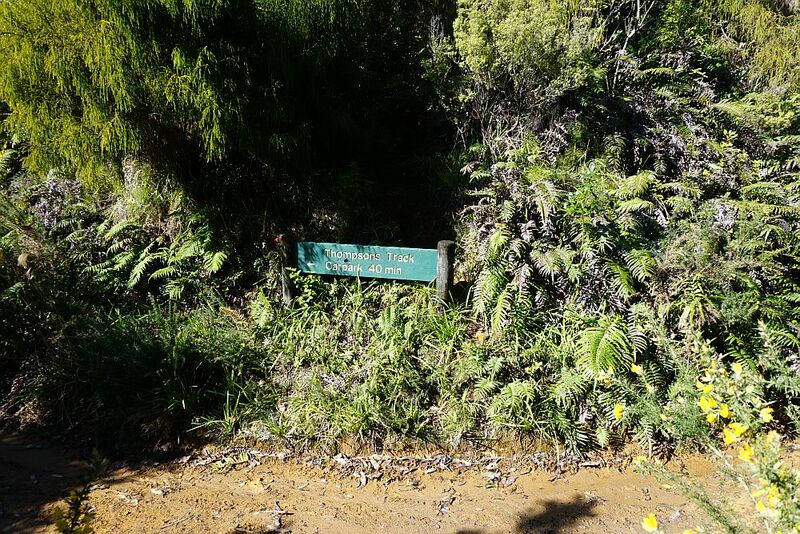 The track starts at the end of Thompsons Track road off SH2 south of Katikati. 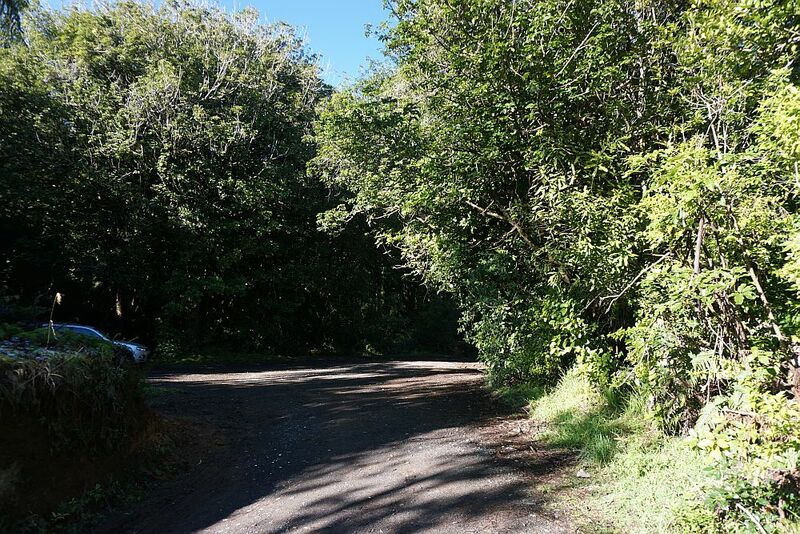 The last part of Thompsons Track is a narrow gravel road, and the car parking area is rough and unmarked. There are no toilet or other facilities. More information about the track can be found on the DoC web site. 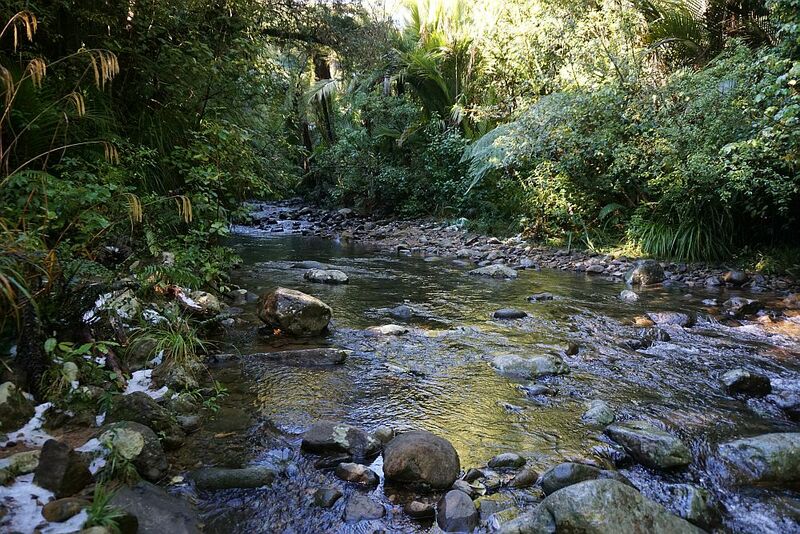 There are two crossings of the Waitekohe Stream which can be difficult without getting wet feet. It’s possible to do some rock hopping, but the rocks can be very slippery. 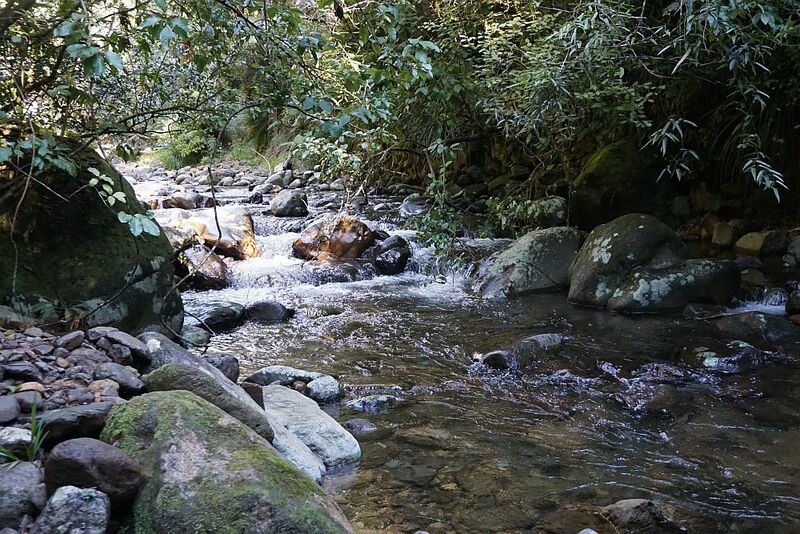 Other stream crossings can normally be performed without difficulty or wet feet. 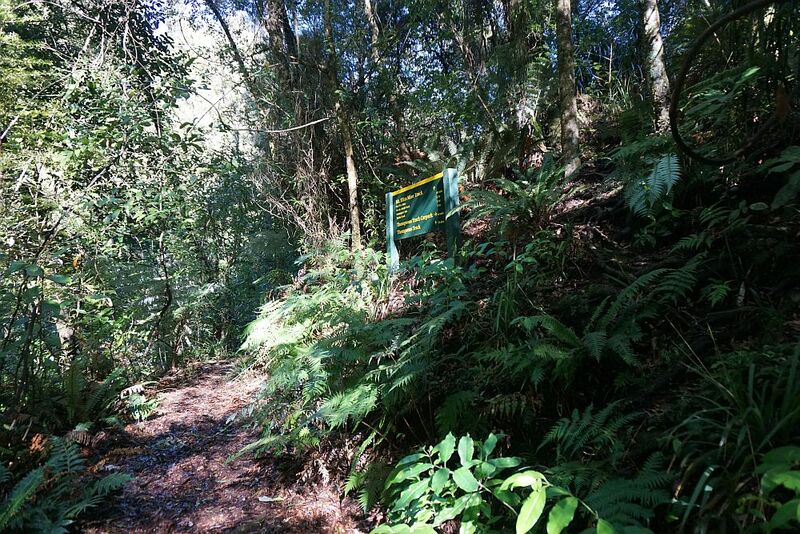 The walk consists partly of a loop returning to Thompsons Track and following this track back to the car park, and the Mt Eliza Mine Track from the loop track to the summit of Mt Eliza. This track continues on to join up with the North South Track. Most of the walk is under tree cover, and would be a good walk during summer months. Even most of the Thompsons Track part of the walk would have shade available during the summer months. The parking area at the end of Thompsons Track road. 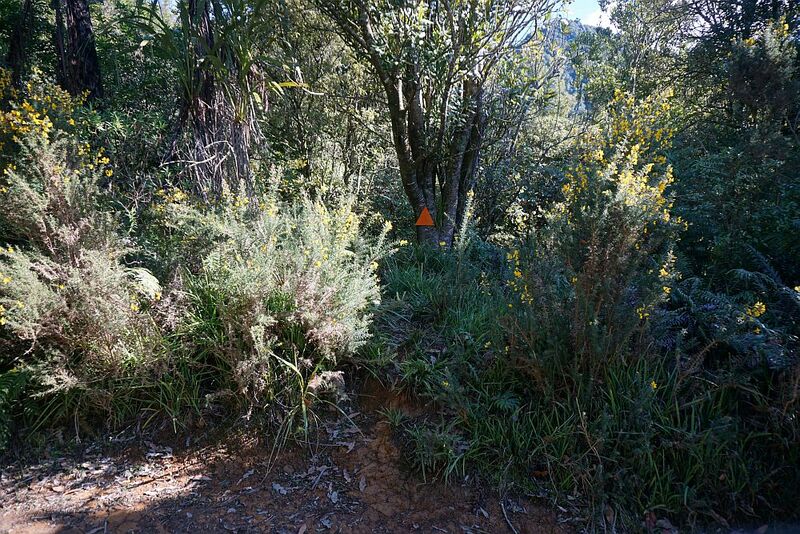 The only indication that a track starts here is a large orange triangle on a tree visible from the parking area, just left of centre in the photo. A few metres down the track there is a DoC sign indicating expected times for the different destinations. 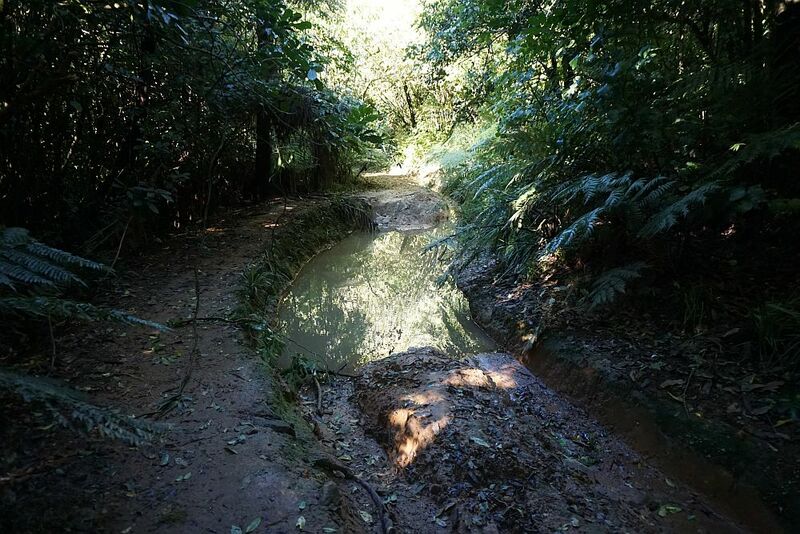 The track from here to the first crossing of the Waitekohe Stream is an old bulldozed track, which can be very slippery when wet. 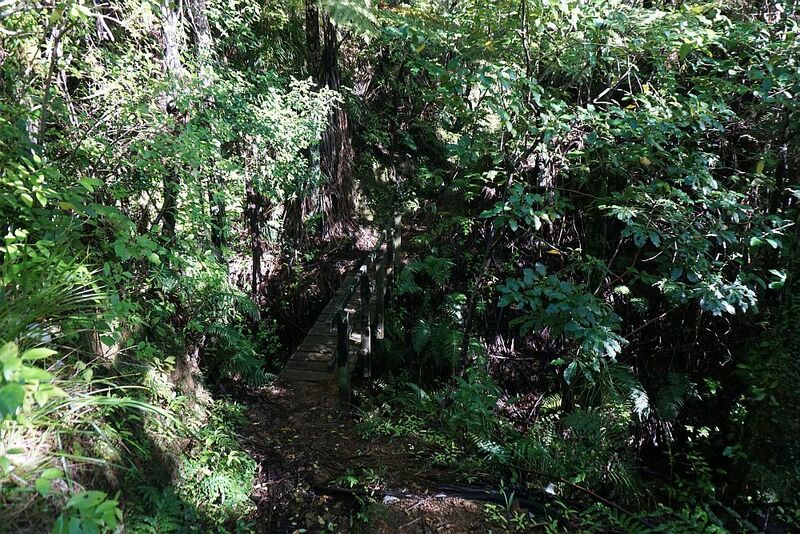 There are bridges over the first two small stream crossings. 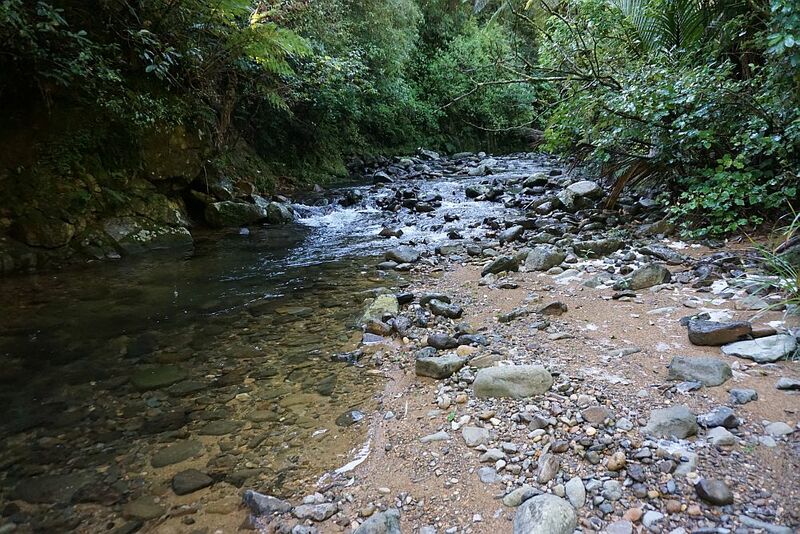 The first Waitekohe Stream crossing, during winter. There are still patches of hailstones on the ground from a hailstorm two days earlier. After crossing the stream the pack track runs up the valley parallel to the stream, with the stream clearly audible along the track, and sometimes also visible from the track. Another stream crossing on the pack track. No wet feet this time, with rock hopping possible. 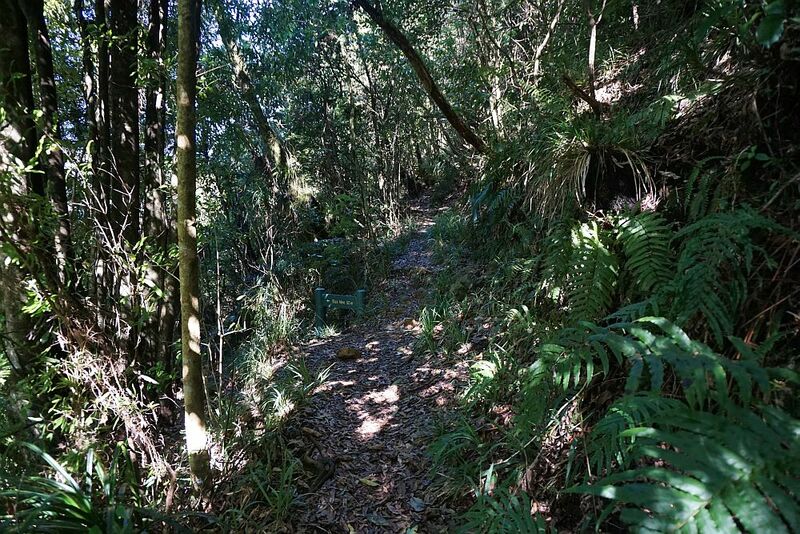 The track to the Mt Eliza Mine and the summit of Mt Eliza branches off the pack track to the right. Details of track walking times. The track is steep and rough in places. 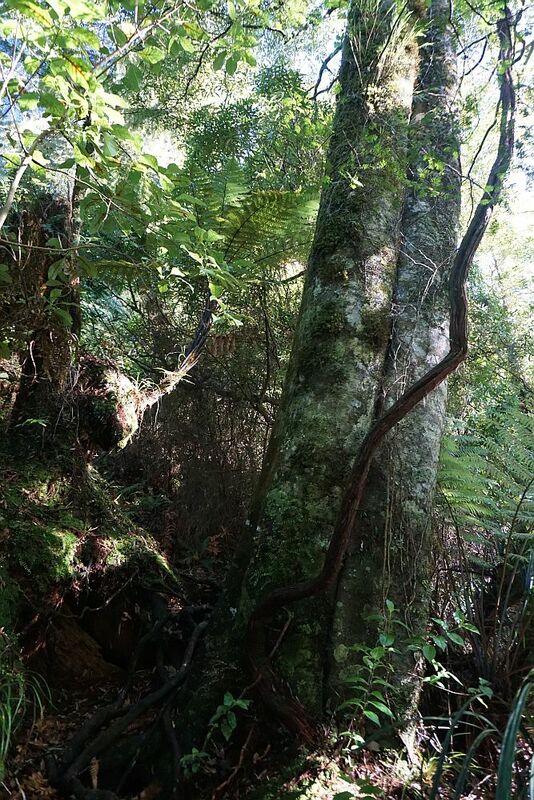 These two trees grow so close that they appear as a single trunk with a split down the middle. They separate into two separate crowns further up the trunk. 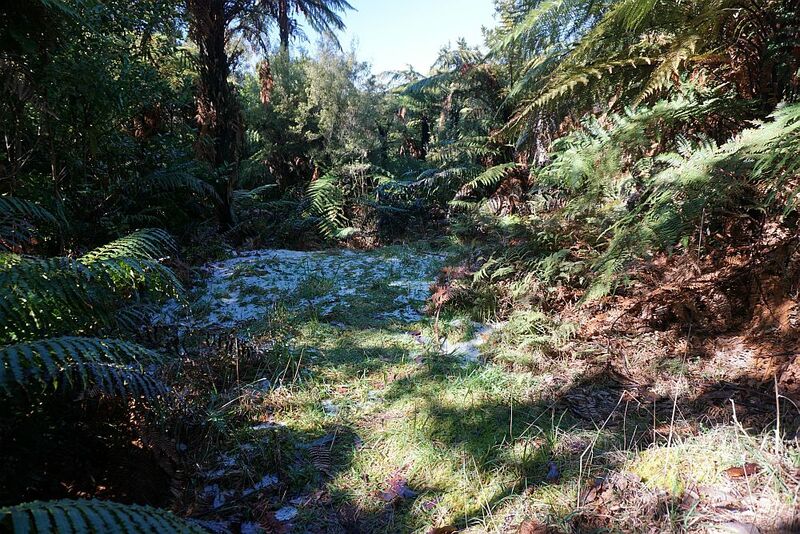 A small clearing (with ice from a hailstorm on the ground) a short distance from the mine appears to be the only remains from the miners’ camp. 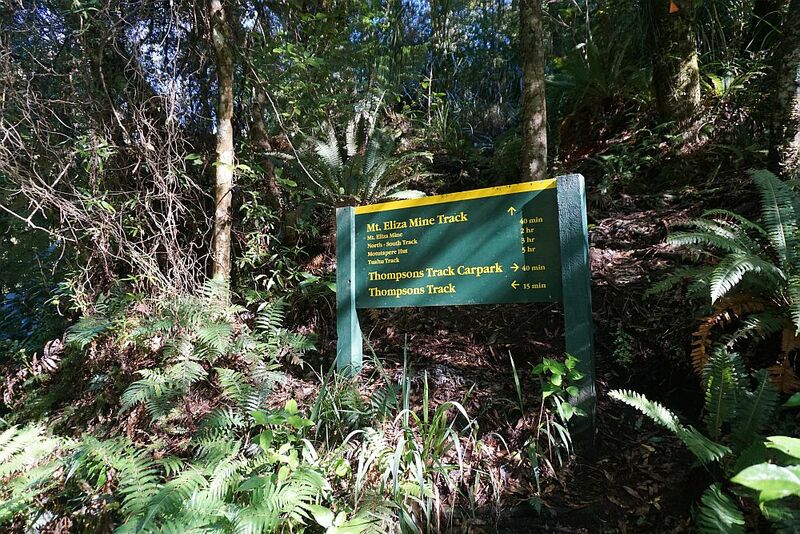 A 50 metre long track branches off to the left at the sign by photo centre, ending at the Mt Eliza mine entrance. The track to the summit and to the North South Track continues up the hill. The mine entrance. No attempt was made to enter the mine. 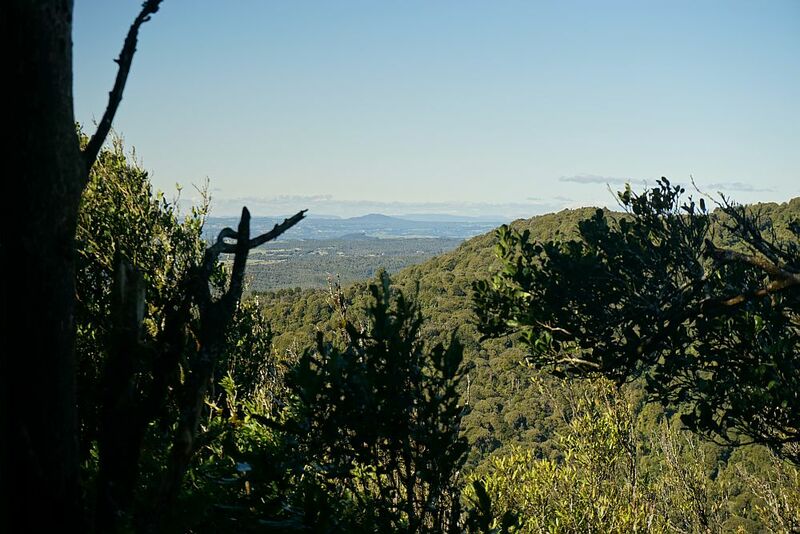 The summit of Mt Eliza is not marked, and there are no viewing platforms or viewing areas. 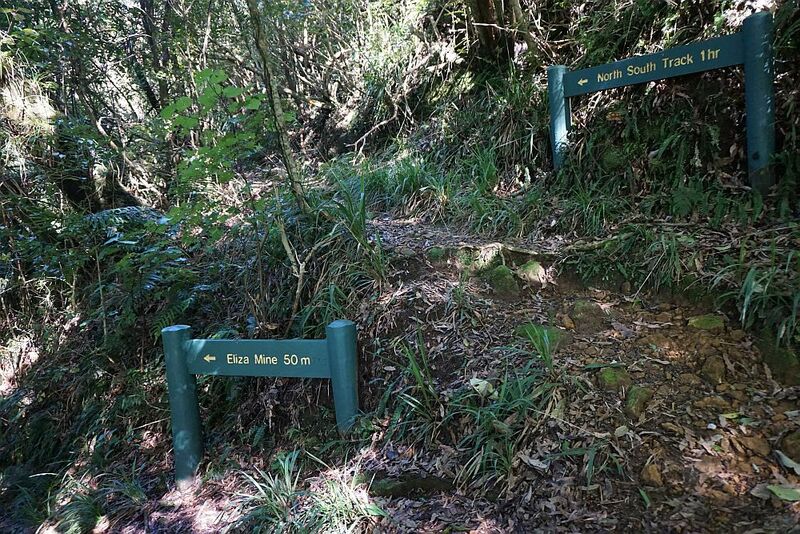 The track follows the summit ridge for about 200m before descending and continuing on to the North South Track. 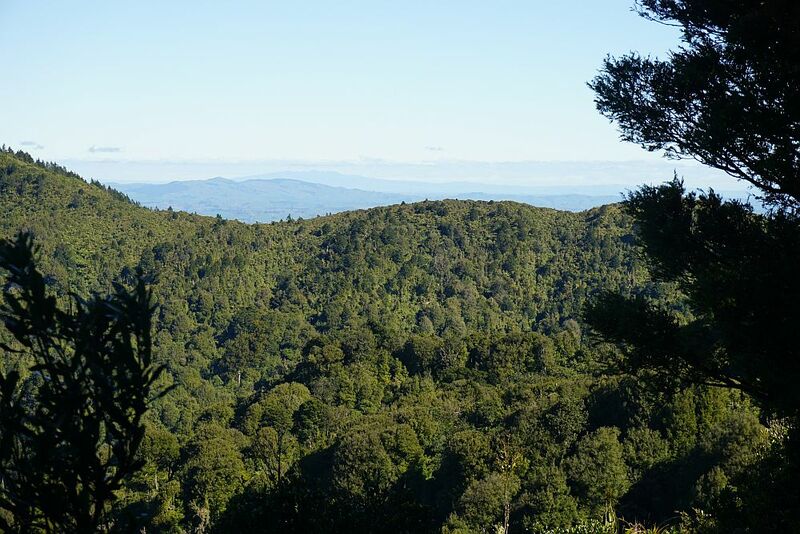 From a small clearing near the summit ridge there are views through the vegetation to the Waikato and towards the eastern part of the Bay of Plenty. 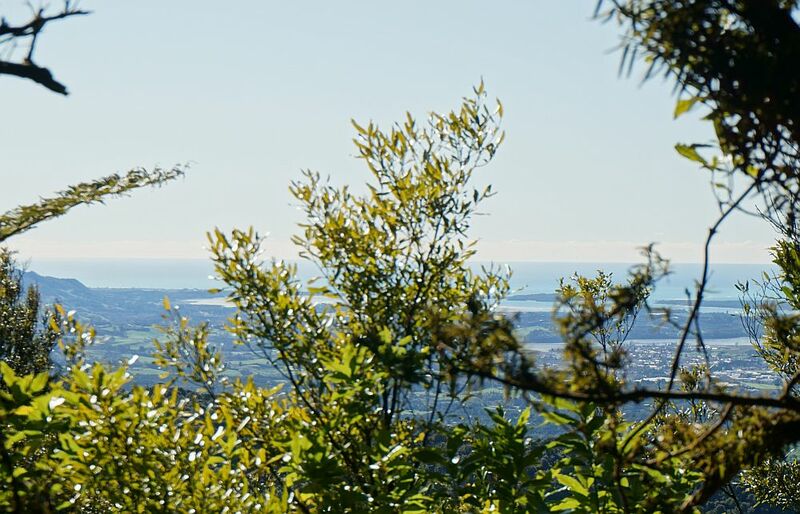 At the far end of the summit ridge there are views through the vegetation to Waihi Beach and the northern end of the Tauranga Harbour. 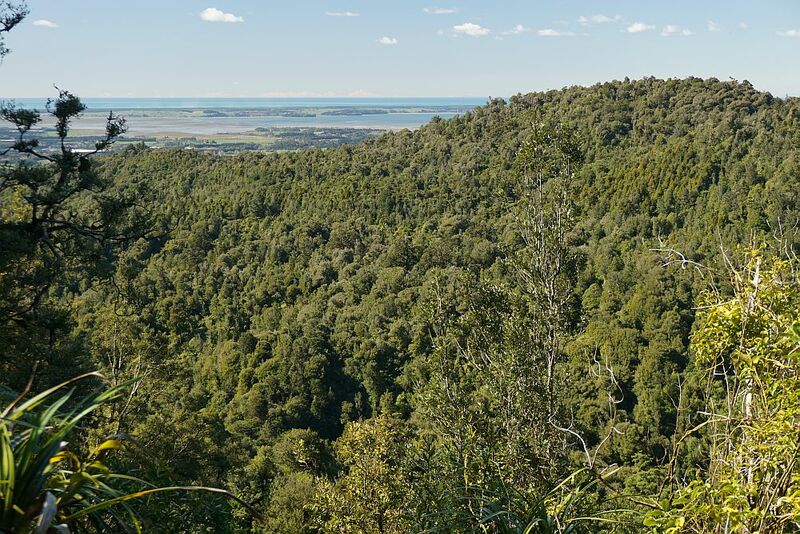 Clearing a little of the vegetation would provide good views to the Bay of Plenty coast. On the return down the hill past the mine this view to Matakana Island and the Bay of Plenty coastline which was missed on the uphill walk presented itself. Turning right on the return to the pack track, heading towards Thompsons Track, it’s not long before the Waitekohe Stream has to be crossed once more. Again it can be difficult without getting wet feet. At least when there was rain a few days ago. 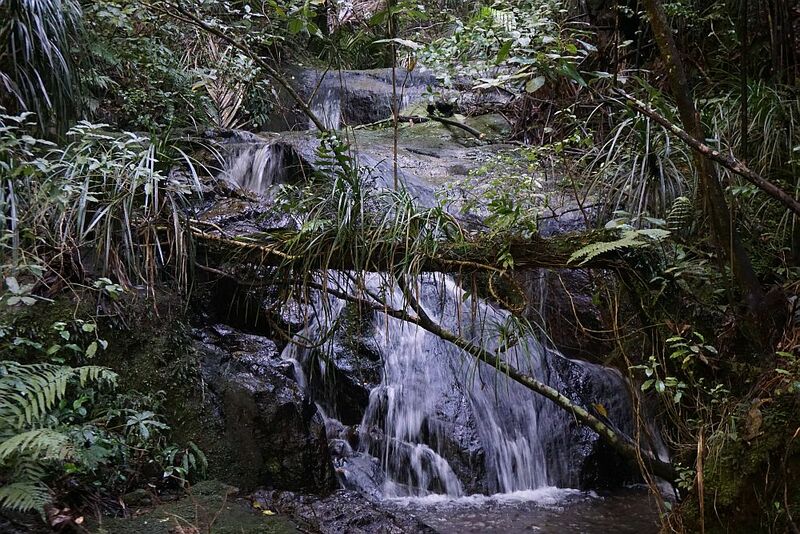 After crossing the stream an uphill climb brings the track out onto Thompsons Track. Turn left to return to the car park. Looking back onto the track as it exits onto Thompsons Track the only indication that it starts (or ends) here is a large orange triangle. Thompsons Track at this point is a narrow, rough 4WD track, which is currently impassable to 4WD vehicles. The walking track goes off to the right, across from the sign visible on the far left. There is a small triangle on the sign to indicate this. 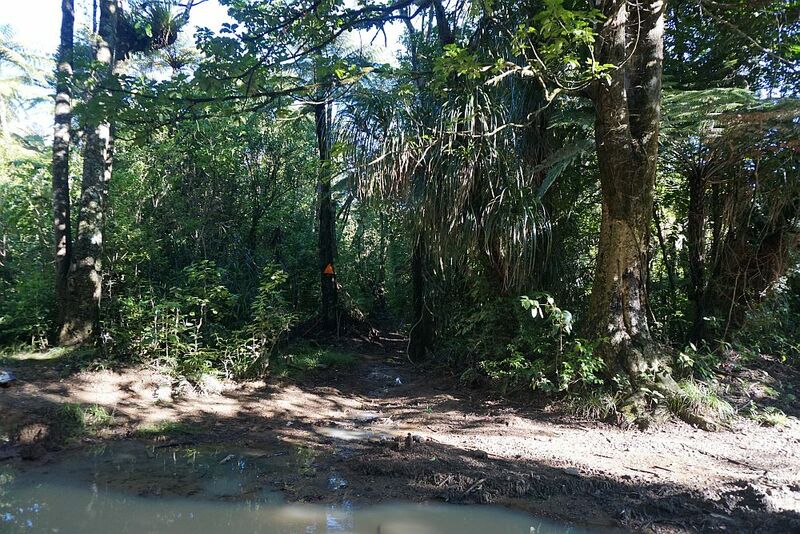 There are mudholes and deep ruts all the way along Thompsons Track. Carpark to Mt Eliza Mine Track junction with pack track: 2.3 km, 50 minutes. Junction to summit, including mine entrance: 1.7 km, 1 h 10 minutes. Summit back to junction: 1.3 km, 40 minutes. 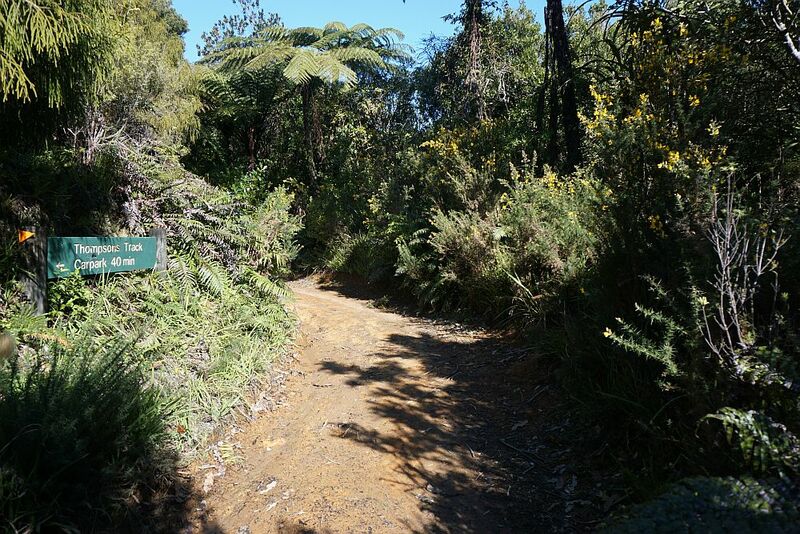 Junction to carpark via Thompsons Track: 2.3 km, 50 minutes. Highest altitude was at the summit where the GPS showed about 595 m above sea level. The topographic map shows the height of Mt Eliza at 581 m. Lowest was the first stream crossing at about 125m asl. 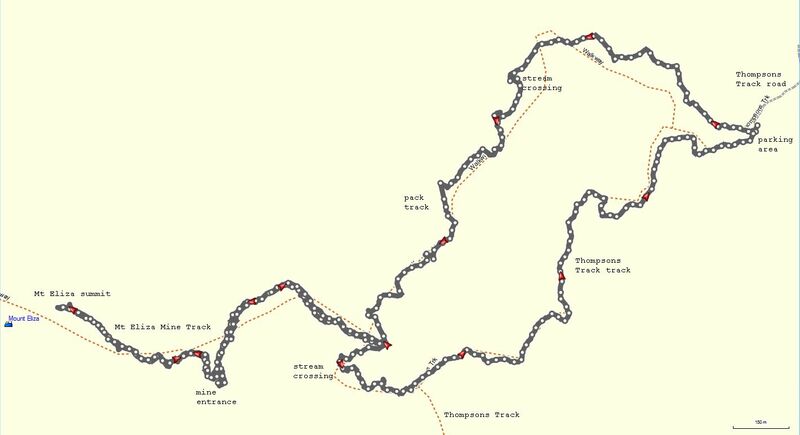 The GPS track log shows the route walked, and the locations of the mine, summit, and stream crossings. The track was walked on August 11, 2015. 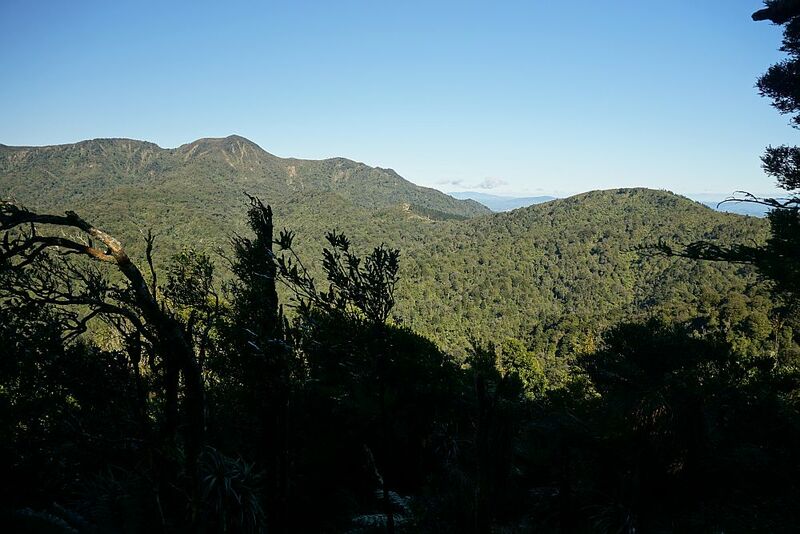 This entry was posted in Walks and tagged Kaimai Mamaku Forest Park, Kaimai Range, Katikati, Mt Eliza, Thompsons Track on 2015-08-11 by nzartig.